Domaine de Massereau is a small yet wonderful, family run campsite which is located in the south of France near to Sommieres, which is between Montpellier and Nimes. Unlike some of the other campsites in the Languedoc region of France, Domaine de Massereau occupies a wonderful countryside location within the grounds of a wine producing Chateau where you can tour the vineyard and more importantly, sample the wine! This lovely 5 star quality campsite lies within over 50 hectares of grounds and is beautifully maintained and landscaped to ensure a real feeling of peace, tranquility and luxury. One of the great things about Domaine de Massereau as we’ve already said is its countryside location. There’s plenty of space for you to get out and explore the surrounding area and there’s even a purpose built cycle track which runs alongside the campsite and allows you to explore much of the countryside around you. Although small in the number of pitches, the number and quality of activities and facilities on-site are second to none and ensure that, whether you’re looking for a quiet and peaceful place to unwind or prefer lots of things to do, you won’t be disappointed. The nearest beach to the campsite is some way off due to the fact that the campsite is in the heart of the countryside however if you do fancy heading off to the coast it’s only 30km away. The swimming pool complex at Domaine de Massereau provides the perfect place to relax or have fun featuring slides, 3 swimming pools, a sauna, spa and jacuzzi. There’s also a great sun terrace which is perfect for adults to relax on whilst the kids have fun splashing around in the pools. 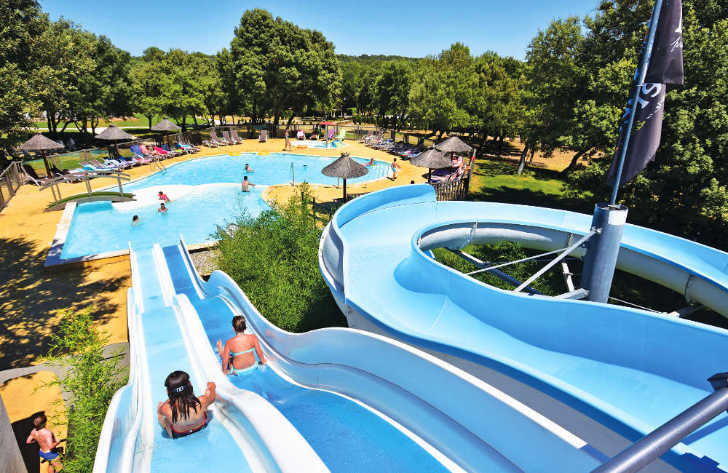 Domaine de Massereau campsite offers a comprehensive selection of activities and facilities on site and also nearby to ensure you have a fantastic family holiday. On-site activities at Domaine de Massereau campsite include table tennis, tennis, football, volleyball, basketball, mini golf, pony rides, badminton, boules, trampolines, playground and cycle hire. Facilities available at Domaine de Massereau campsite include WIFI, restaurant, takeaway, pizzeria, bar, groceries, games room, animation team, washers and dryers. Accommodation at Domaine de Massereau campsite includes a range of lodges that are available from Eurocamp.